"Click the camera for Hap's Photo Album!" This was Hap's favorite picture. 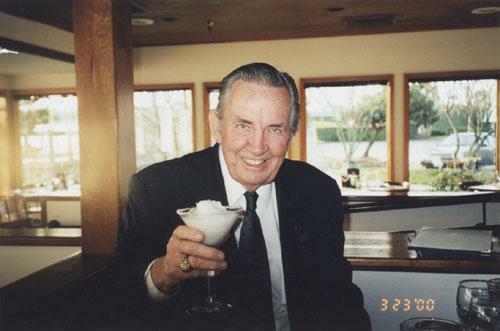 During World War II, Menlo Park resident Raymond "Hap" Halloran found himself on the giving and the receiving ends in the air war over Japan -- first as a B-29 bombardier and then, after his plane was shot down over Tokyo, as a prisoner of war. The prison camps were unmarked and thus occasional targets of apparently ferocious friendly fire, including the March 1945 fire bombing of the city. 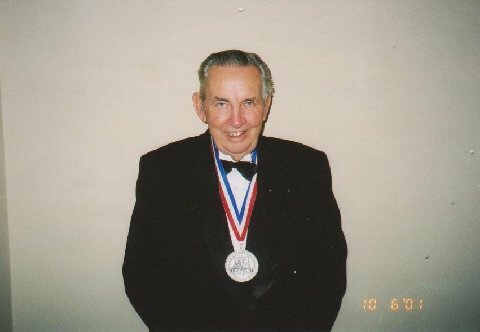 Mr. Halloran, who died June 7 at the age of 89, experienced parachuting from his doomed airplane; humiliation as a POW when put on display in a zoo; solitary confinement; a successful business career; decades of nightmares as he tried to escape wartime memories; and, finally, relief after reconciling with former enemies, according to an autobiographical account. When invited, Mr. Halloran would talk about his experiences. He spoke in Japan at museums, temples and in Peace Parks in Hiroshima and Nagasaki. "They also were seeking closure," he wrote of his audiences, some of whom reciprocated by visiting him in the United States. While visiting Japan, he met the fighter pilot who shot him down, and a "good guard" from his time as POW, according to his account. Mr. Halloran is survived by his sons Dan of Barcelona and Tim of Brentwood; and by his daughter Peggy of Redwood City, relatives said. Members of his family were not available for interviews, but a memorial service is being planned, Dan Halloran said. The Almanac will announce it when the family settles on a date. Raymond Halloran grew up in Cincinnati, the second of five boys. He volunteered for the Army Air Force following the December 1941 attack at Pearl Harbor. After training, he joined an 11-man crew that flew a new B-29 bomber from the Midwest to Honolulu and then to an airfield in the Northern Marianas Islands, from which were launched bombing raids on the Japanese mainland. On his crew's fourth mission, a Japanese fighter plane critically damaged two of his B-29's four engines such that it left the formation. The crew bailed out at 27,000 feet at an ambient temperature of 58 below zero, he said in his account. Five men survived, he said. After 24,000 feet of free fall, he deployed his chute and a fighter pilot flew by and saluted him, he wrote. "A rarity," Mr. Halloran noted. Indeed, the graciousness did not last. On the ground, a crowd of civilians set upon him and administered "severe beatings," he wrote. He was nearly dead by the time Japanese soldiers came upon him and took him off to solitary confinement for 67 days in a "cold dark cage." He received no medical treatment and was forbidden to talk except when interrogated, he wrote. It was during this time that Allied forces fire-bombed Tokyo. "The heat, smoke and firestorm were absolutely terrifying," he wrote. After the fire bombing, soldiers took him to the Ueno Zoo, Mr. Halloran wrote, where they displayed him in a cage as "the hated B-29 prisoner," naked, unwashed and covered with sores from fleas, lice and bed bug bites. "Conditions were extreme," he wrote. "I cried (a form of relief) and prayed constantly." When eventually he was transferred to live with other captured air crews, unwitting Allied pilots strafed and bombed the camp, he wrote. The prisoners talked of food constantly. With peace in August 1945 came liberation to a hospital ship, then back to the states and months in a government hospital. He returned to civilian life and a career, but with changes, including nightmares for 39 years, he wrote. "Very disruptive to my family life," he wrote. "In the early years after the return from POW days I absolutely tried to wipe out all those bad memories of my time in Japan. I failed." Relief began with reconciliation. He flew to Japan in 1984 to "view people and places as they are presently," he wrote. "Positive results slowly became evident in my outlook, feelings and judgments. Understanding and reconciliation became a reality." 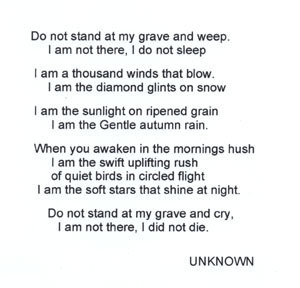 "Whenever I learn of the passing of a B 29 crew member or friend I sort of call to mind this poem." Thank you for all of your thoughts on my Dad. We had celebrated my sister Peggy's birthday. Dad sang happy birthday and there were many hugs and kisses.The staff at the VA put him to bed at about 2000 hrs. He shook their hands and thanked them for caring for him and then at 2030 PDT he died in bed. He knew we loved him and was at peace. We have a memorial fund set up with the VA because they really took good care of dad and the other vets. The memorial Mass is at St Raymond Church at 1100 Santa Cruz Ave. in Menlo Park CA 94025 on Friday 6/17 tomorrow at 1200 noon. There will be a reception after. Dad will be interred at Arlington National Cemetery with full honors. The date hasn't been finalized. For those of you who live close or those of you who want to attend, Hap Halloran will be interred in Arlington with full military honors on November 18th, a Friday, at 1300. He would have been humbled by this -- and I know he would say "I am no hero". But to me, he was and always will be. Hap always closed his communications with "ENJOY LIFE!" Raymond F. (Hap) Halloran was born in Cincinnati, Ohio on February 4, 1922 the second of five boys to Paul and Gertrude Halloran. He died on June 7 at the age of 89 after a long and extraordinary life. In Cincinnati, Hap developed an early fascination for airplanes and after Pearl Harbor, joined the Army Air Force. He shipped out to the Pacific Theater in 1944 as a B-29 navigator. In a memoir published in 1999 Hap tells his remarkable wartime story: Shot out of the sky over Tokyo, stalked by a Zero pilot as he fell in his parachute, and spared by that pilot; taken to the dreaded Kempei Tai prison and beaten, tortured and starved; an inspiration to his fellow prisoners who would become friends-for-life, including Colonel Pappy Boyington and Brigadier General Robert Goldsworthy. After the war Hap returned to his hometown, recovered from his wartime injuries and went to work for the Rock Island Railroad. After transferring to Detroit and changing from railroads to the trucking business, he met Donna Carolyn Peterman and they were married in 1953. In 1958 Hap took a job with Consolidated Freightways (CF), the company that he would help to build into one of the great transportation companies in the country. In 1973 he was named executive vice president and became the company’s top sales and marketing officer. 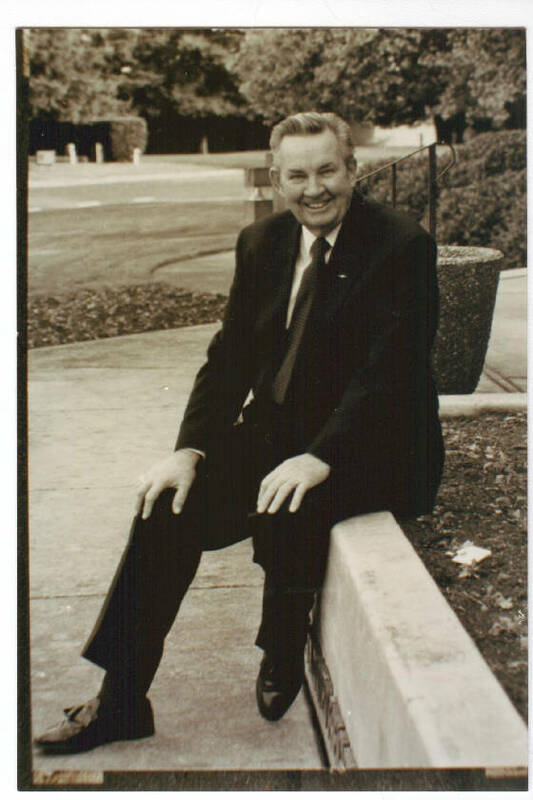 He retired from CF in 1987 and was made senior vice president emeritus. After the war and throughout his remarkable business career Hap battled the nightmares of post-traumatic stress disorder. After 40 years of this, he decided to attack PTSD head-on. He was helped with travel arrangements by US ambassador to Japan Mike Mansfield and made the first of many "reconciliation" trips to Japan, to what soon turned out to be great media attention and national acclaim. After a few years he had met the pilot who shot him down and counted as close friends and correspondents, Japanese historians, artists, school teachers, war veterans and fighter pilots. Hap and Saburo Sakai, famous Japanese WWII ace, became golfing buddies and Hap hosted him in California in 1992. His last trip to Japan was in 2007, as guest of producers of a Tokyo Broadcasting documentary. The nightmares had long ago ceased. Throughout the US, Hap spread his message of closure – perseverance, forgiveness, reconciliation and peace. He spoke to large military gatherings and convocations of veterans including his own beloved B-29ers, as well as local business groups, civic organizations and schools. At war-time anniversaries he was much in demand. In 1992 Boeing celebrated the B-29’s 50th anniversary and, on the dais with generals and the Secretary of Defense, Hap was keynote speaker to thousands of attendees. National media came to him for perspective and memories. He traveled with CBS-TV to Tokyo in 1995 for a special on the 50th anniversary of the end of WWII and in that year alone did 30 TV interviews and appeared in 12 documentaries on the war. Over the years he appeared at events and on panels with Paul Tibbetts and Dutch Van Kirk, captain and navigator on the Enola Gay. Hap delivered Pappy Boyington’s eulogy at Arlington National Cemetery on January 15, 1988. 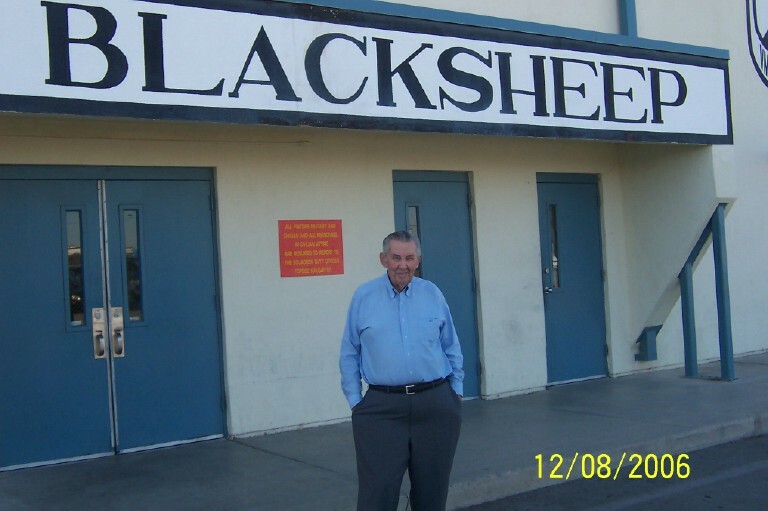 Four years later, at the 50th anniversary reunion of the BlackSheep squadron, Hap was the main speaker and was inducted that night as an Honorary Blacksheep. Hap has been featured in many books on WWII flyers and the war in Japan and was extensively interviewed by Iris Chang shortly before her death, in her research for a book on prisoner-of-war experiences. Hap has received countless awards from military and civic organizations. In 2001, along with former President George H.W. 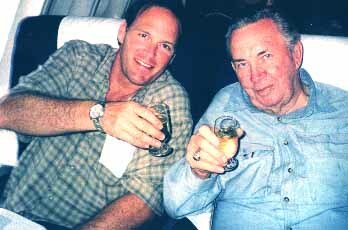 Bush, he was inducted into the American Combat Airman Hall of Fame. At the time of his death he was being cared for by the staff at the Veterans Affairs Hospital in Menlo Park and is survived by his immediate family, sons Dan and Tim and daughter Peggy. Their mother Donna died in 1991. Local funeral services are pending. Hap will be interred in Arlington National Cemetery with full military honors. Also Pending. Click on the camera for pictures of Hap's full military funeral with honors at Arlington National Cemetery. On Friday 18 Nov 2011 the ashes of Ray "Hap" Halloran, former navigator on the "Rover Boys Express" of the 499th Bomb Group and prisoner of the Japanese, were laid to final rest in Arlington National Cemetery. Full military honors were rendered, including honor guard, band, horse-drawn caisson and 21-gun salute, as Hap unquestionably deserved. The ceremony, with its military precision and order but basic simplicity, was impressive as always. It's hard to keep a dry eye when Taps sounds. Many of the Halloran clan traveled quite a distance to attend, some from Ohio, others from California. My wife and I came to pay our respects and also to represent the 73rd. We were all warmly welcomed and embraced by the Hallorans, who are wonderful people. Some others were also at the ceremony. We met a lady who once interviewed Hap for CNN, and filming unobtrusively in the background were a couple of gentlemen who appeared to be Japanese. That would be entirely fitting, as Hap was a legend on both sides of the Pacific. I am thankful you were able to observe Hap's last moments above the surface. Did you notice him grinning in the trees as you were being sad? Hap is very much alive in my heart and in many others.